I searched the hotel lobby where we were camped in Michigan for a USA Today. It used to be that this amazing newspaper was written, assembled, composed, printed locally across the country, and appeared for free in most hotels and inns next morning. Not so much, any more. Its lightweight reminder is now available for $2.00 on the newsstands, but faces heavyweight competition for readership, and thus, for advertising revenue. The quest reminded me of my early days in Delhi, a small town in southern Ontario where newspapers abounded. We enjoyed our weekly Delhi News Record which was mailed to us, rolled and sealed. The Simcoe Reformer was another weekly that came by mail. And every morning there was a faithful, reliable delivery by news carriers on bikes of the London Free Press and Toronto’s Globe and Mail. Those morning news boys were held in high regard. Afternoons– citizens had a choice of the Brantford Expositor, The Toronto Star and The Toronto Telegram. Nowadays, morning newspapers are delivered by slow prowling cars whose drivers steer from the passenger seat as they pitch bagged editions through the dark onto the driveway. Newsboys, and newsgirls are history. My parents drafted me when I was 10, and advised that I would be delivering the Expositor. It had a circulation of about 30 subscribers across our little town of 3,000 souls. Pretty quickly, a strong, steel-banded carrier basket was bolted to the front of my bike. I was presented with a wrinkled, torn map of Delhi, and told to ‘dot’ the streets where I would be making a delivery. The process of learning a job was uncomfortably strange. My Dad drove me around the route the first time, taking me to little homes, back alleys, upstairs apartments, small mansions, businesses and eating places. While I had seen most of town on my own, I had never identified, remembered or organized street names before. More intimidating–the subscribers. Delhi was a town of many backgrounds and nationalities. Hungarians, Belgians, Ukrainians, Polish, Germans, English, Irish, Scottish, Italian…many newly arrived after World War II… all figured in the readership. While I may have sat beside their children in school, or skated with them down at the rink, I had never seen their homes and yards so intimately or struggled with their accents and temperaments so regularly. Knocking on their doors, and collecting ‘paper dues’ was mind-expanding. The newspaper was 2 or 3 sections, and could lay flat on a doormat, or folded inside the screen door, or tucked between the door knob and the jam. Delivery was five days a week, no Saturdays or Sundays. Weekly fee: 40-cents. I delivered the Expositor for a year, but I don’t recall ever reading beyond the headline. My brain was just too small and overwhelmed, and less than curious about the world beyond our town. 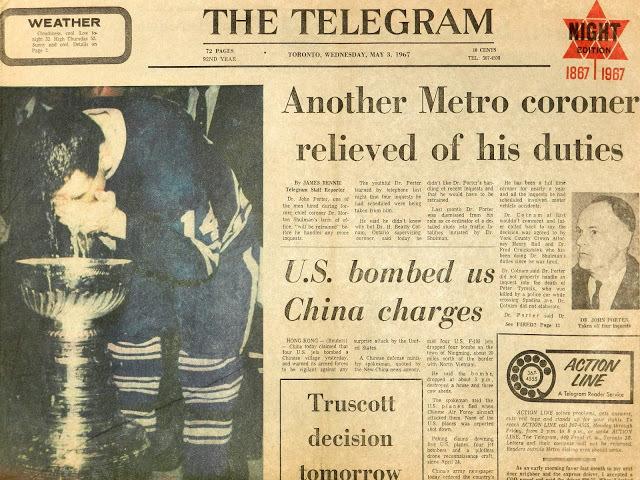 Next year, I got to deliver the Toronto Telegram. It competed handily against the Toronto Star. I had 40 subscribers, a bright red Telegram newspaper bag, and a giant steel ring with green subscriber tickets on it, each punched ‘paid’ for the preceding two weeks. The Telegram was big money for me, and opened my eyes and hands to the attractive feel of cash in my pocket. I was getting a penny a paper. Every two weeks I slid the funds across a magnificent marble counter at the post office and filled out a money order payable to the Telegram, at the corner of Bay & Adelaide Streets in Toronto. My world was expanding to strange and exotic places in a city I had never visited. But still, the adventure was the daily route. The papers were dumped in a wire-bound lump at the town hall. I broke them open using a notched steel washer. One twist across the wire and the papers exploded with relief. They filled the bag, heavily, and hoisting that onto my bike carrier, I wobbled to my first customer, Russ Christiansen, a jeweler at the corner of Main and Church. Above his store was an apartment. With care to fold the paper in its own sleeve, I learned to toss it to the top of the stairs where it would open flat at the door. This worked any day but Saturday when the extra sections could burst open five steps up, and that would require a major repair. Up Main street, across King, I left a copy at the Delhi News Record offices and then headed east along King to the Belgian Bakery. The breads and doughnuts there were not to my liking; they used granulated sugar and a lot of oil. But what they did offer, and I treasured, were aircraft cards. These were trading cards, printed, black-and-white glossies of WWII fighter craft and bombers. At a dime a pack, they were in my budget. Several stops later, I dropped off at DorCliff Printers. The owner, Cliff Whitehead, always smiled as I called him Mr. Dorcliff. It wasn’t til years later that I learned the business was named for him and his wife Dorothy. Crossing over James Street, which was Highway 3, I hauled up the Brantford Road to the top of Bell Street to leave a paper in a reader’s garage. One snowy night in January I entered the garage and found a small cocker spaniel. Stretching over to pet him, I pulled my hand back with a string of red streaming tooth marks as a reward for my gesture. Across Delcrest, along Connaught, behind the high school and over the tracks, past Flemish Motors, I headed down to Pal Cleaners which was the southern corner of my route. 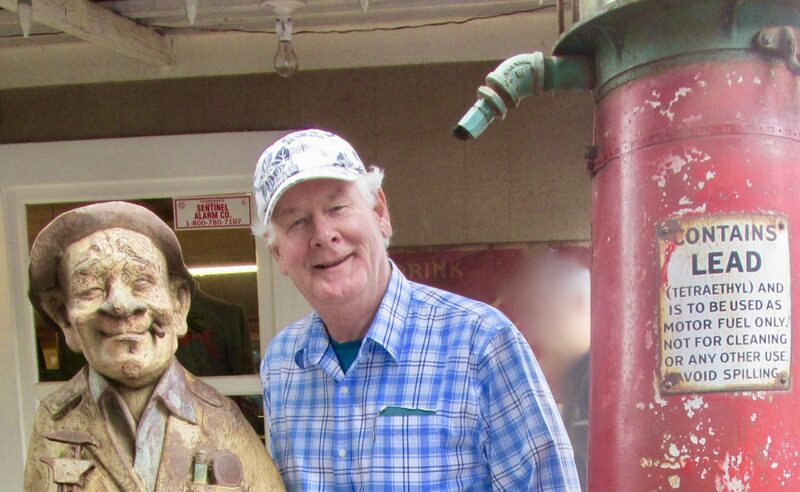 Mr. Bruder was a jovial man who always greeted me with a joke and a tease. While the clothes hung in rows, the air was full of the hot smells of cleaning fluid and noises of driers and laundry. Back behind Wills Motors and Smiths Lumber along Orchard street I had to pick up the bike speed to out-pedal an aggressive Boxer dog who looked forward to seeing me daily. Twice I came home with a blue bruise on my thigh where he took a bite. Why didn’t I take a different route? Because it was the game we played. Over on Imperial Street next to the tobacco factory I had two customers, and I can recall hiking up the stairs to one, finding their daughter wrist deep in flour, looking for newspaper money. The aromas of vanilla, chocolate and warm cookies were tantalizing, and the event still remains vivid today, 60 years later. Back along to Ann Street, and under the railway tunnel, my next stop was Dunn’s Variety. They didn’t take the Telegram, but she sold ice cream. There is nothing so exquisite as biting into a sugar-coned, peanut Drumstick in the middle of January. With snow and slush covering the spokes of my bike, I pedaled, steering one-handed down William Street to Gilbert. On the left was Maes Lane, where our customer was the Verspeetens. Little did I guess then that this name would own probably a couple hundred tractor trailers that race along the 401 to Detroit every day 40 years later on. I am proud of my association with Verspeeten, and tell my wife I knew them before they went big time. Maes Lane opened up at the corner of Main and Spicers Bakery. Spicers was the number one client on my list, and was also the source of the world’s best glazed doughnuts, expertly crafted by Mr. Palmatier. Even today, in a crowded field of Tim Horton’s, Dunkin Doughnuts and Krispy Kreme, Mr. Palmatier’s touch remains unequaled. North and east bound, I would head back, passing Luciani’s whose store was a robust vegetable display worthy of Rembrandt. He is a plump, older gentleman with silvered brush cut hair and dark eyebrows. He growls a friendly smile and places two apples into a used paper bag with strong, old, permanently tanned hands, and sends me up Main Street to the Kinsmen Hall. Outside is a remarkable cherry tree that we would raid every summer. My last delivery was on Queen Street to a house across from Mr. Hanselman. He was a WWI vet who lost his arm in the war. Across the street, I drop my last paper on the porch. I won’t see this house again for many years until I get a job re-roofing. On a rainy afternoon in the summer of ’69, I slide down their roof, grabbing the eaves trough on my way. They find me on the porch, and pick me up, not realizing I had been there many times before. Fast forward, 2019. Curious, I just checked the internet today, and find that The London Free Press, Brantford Expositor, Simcoe Reformer and Delhi News Record are all still in circulation, but owned by the same company, Postmedia Network. The Toronto Star, and Globe and Mail continue to thrive. Only my old employer, The Telegram, has hit the bin, being replaced by the Toronto Sun. I wonder about USA Today and its future. And the paper route? A youngster’s entree into life, society and work? Truly a thing of the past. Thanks for reading this Iliad. Names like Doug Foster, Grant Smith, his brother Bob, Ken Antosuc and Barry Boughner come to mind as those news carriers who made the rounds, long ago!